Easter is a fabulous time when it comes to delicious desserts and sweet treats, and whilst the majority are either chocolate-based and/or egg-shaped, there’s just something so delicious about hot cross buns. I don’t know if it’s because they feel so ‘traditional’ and have been around for so long, but there’s just something so comforting about them. I wanted to give this old-school favourite a little contemporary twist, and when I thought about it the answer was obvious – hot cross cupcakes! 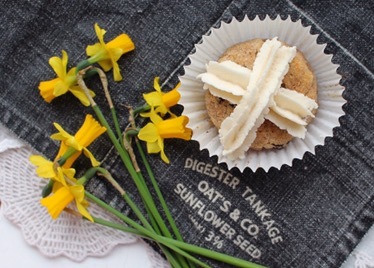 The recipe I’ve created for these combines the delicious cinnamon spice and juicy raisins of the traditional bun with all the lovely cakeyness (not a word but should be) and creamy frosting associated with the cupcakes that have taken the world by storm in recent years. 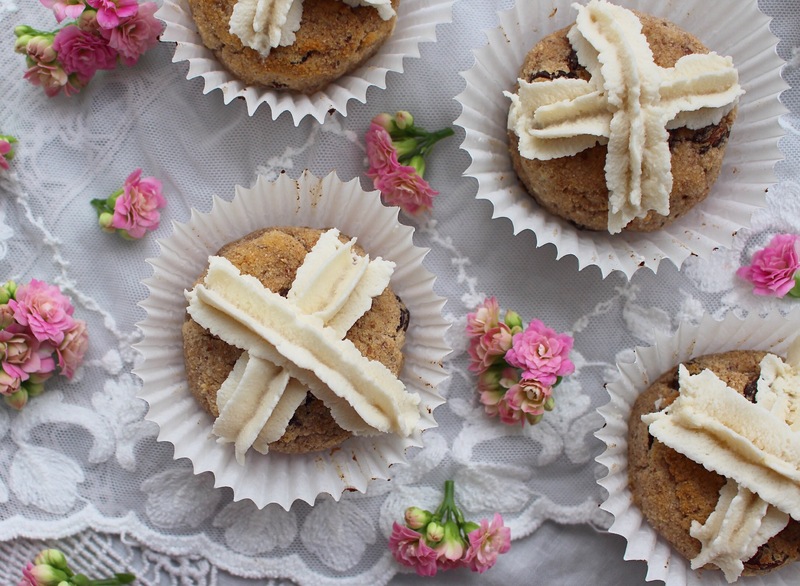 These cupcakes are just so scrumptious – they’re made using coconut flour, ground almonds and bananas, so they’re light and fruity which I think works really well with the more classic hot cross bun flavours. They’re really easy to make (no food processor necessary) and I love them because they’re just something a little bit different, but with a respectful nod to a time when Easter wasn’t quite so franchised and commercialised. These are definitely my new Easter faves and I have a feeling I’ll keep on making them all year round! Add the coconut flour, ground almonds and cinnamon to a mixing bowl and stir together, then add in the bananas, flax eggs, almond milk, maple syrup and coconut oil one by one, making sure everything is mixed together well. Stir in the raisins and spoon the mixture into cupcake cases. Bake these in the oven at 180 degrees for 30 minutes, or until the cupcakes are golden brown on top and a fork comes out clean. Leave them to cool for an hour or so. For the icing, simply mix together the ingredients in a small bowl and use a piping nozzle to draw crosses on top of the cakes. P.S .don’t forget to check out all the other amazing Easter recipes below that our lovely friends at the #virtualeasterparty have created! These are so cute! I love that you’ve made these cupcakes instead of the traditional buns! I made these the other day and both myself and Peter absolutely loved them. So easy to make and they smell gorgeous when cooking. Great to have something that doesn’t use refined sugars etc. for Easter. The only trick bit I found was making the icing, do you add water to the coconut cream which I assume is the normal coconut cream block rather than the milk/yoghurt?